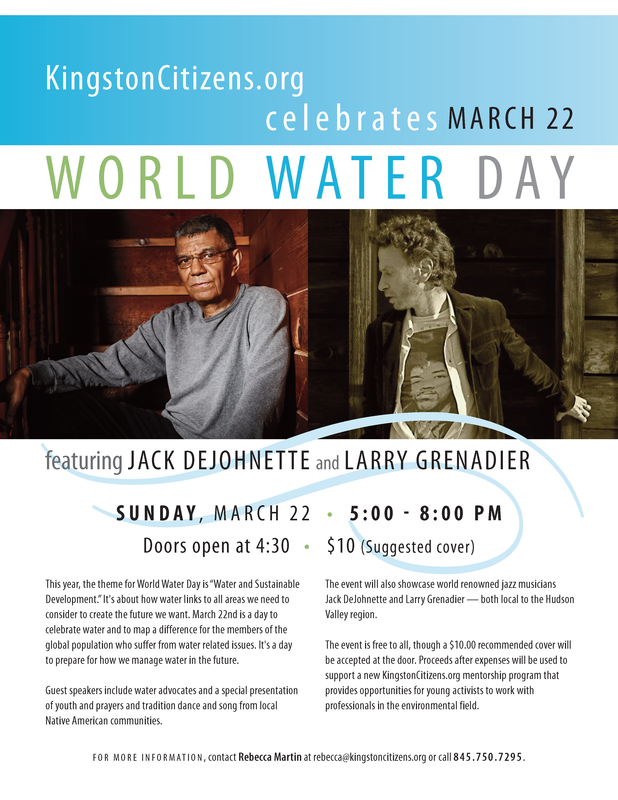 KingstonCitizens.org is proud to host a special event at BSP (323 Wall Street in Uptown) Kingston, NY to mark World Water Day on Sunday, March 22nd, 2015 from 5:00pm – 8:00pm. (Doors at 4:30pm). This year, the theme for World Water Day is “Water and Sustainable Development.” It’s about how water links to all areas we need to consider to create the future we want. 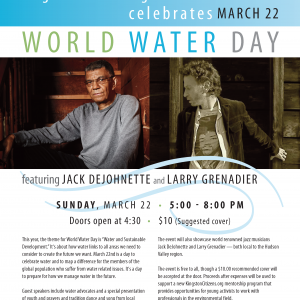 March 22nd is a day to celebrate water and to map a difference for the members of the global population who suffer from water related issues. It’s a day to prepare for how we manage water in the future. Guest speakers include water advocates and a special presentation of youth and prayers and tradition dance and song from local Native American communities. 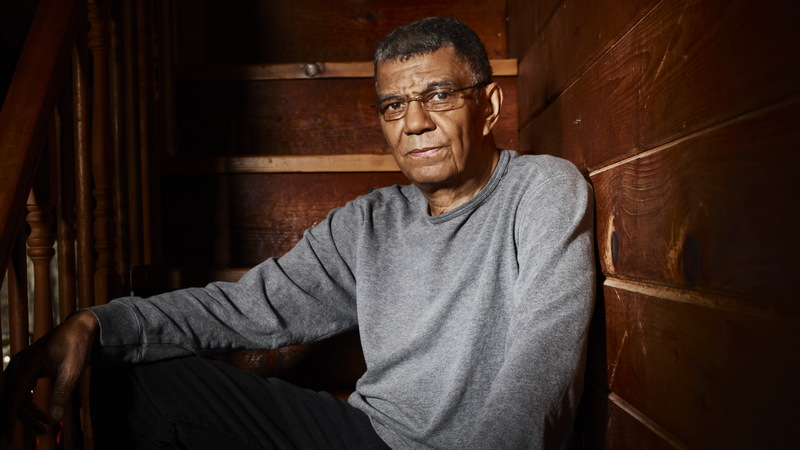 The event will also showcase world renowned jazz musicians Jack DeJohnette and Larry Grenadier – both local to the Hudson Valley region. 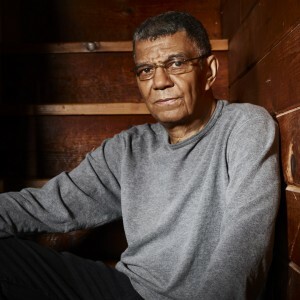 In a career that spans five decades and includes collaborations with some of the most iconic figures in modern jazz, NEA and Grammy winner Jack DeJohnette has established an unchallenged reputation as one of the greatest drummers in the history of the genre. Th list of creative associations throughout his career is lengthy and diverse; John Coltrane, Miles Davis, Ornette Coleman, Sonny Rollins, Sonny Rollins, Thelonious Monk, Bill Evans, Stan Getz, Keith Jarrett, Chet Baker, Herbie Hancock, Dave Holland, Joe Henderson, Freddy Hubbard, Betty Carter and so many more. Along the way, he has developed a versatility that allows rom for hard bop, R&B, World Music, Avant-Garde and just about every other style to emerge in the past half-century. As one of contemporary jazz’s most respected and accomplished bassists, Larry Grenadier has built an expansive body of work that encompasses a variety of significant projects with many of the genre’s most inventive and influential musicians. Over the course of a performing and recording career that spans three decades, he’s earned a far-reaching reputation, for his instrumental talent, for his instantly recognizable tone, and for his sensitivity, imagination and creative curiosity that have established him as an in-demand sideman and valued collaborator. Grenadier’s trademark upright bass work has been a longstanding fixture in the bands of pianist Brad Mehldau, guitarist Pat Metheny, and has graced albums and groups by a broad array of prestigious artists including Paul Motian, Charles Lloyd, Enrico Rava, Danilo Perez, Chris Potter, Joshua Redman and Kurt Rosenwinkel. He’s also found time to make three albums with his acclaimed trio Fly and to record five more with his wife, noted singer/songwriter and founder of KingstonCitizens.org Rebecca Martin. The event is free to all, though a $10.00 recommended cover will be accepted at the door. 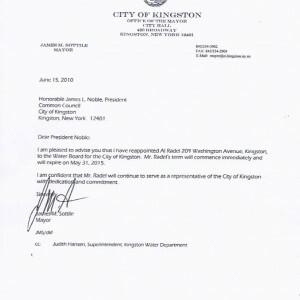 Proceeds after expenses will be used to support a new KingstonCitizens.org mentorship program that provides opportunities for young and old to participate in regular city government meetings. The film “TAPPED” will be screened at Kingston Candy Bar next door to BSP from 5-8pm. Visit and have your water bottle filled with filtered tap water! 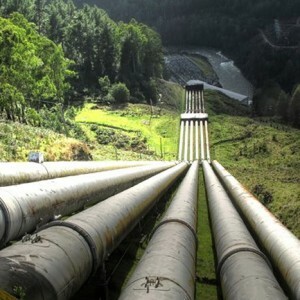 KingstonCitizens.org sponsors a public educational discussion titled “Water and Waste Water Infrastructure 101” on Tuesday, March 24th from 6:00pm – 8:00pm at the Kingston Public Library, 55 Franklin Street in Kingston, NY. The group’s guest will be Water Resource Specialist Candace Balmer of RCAP Solutions (Resources for Communities and People). 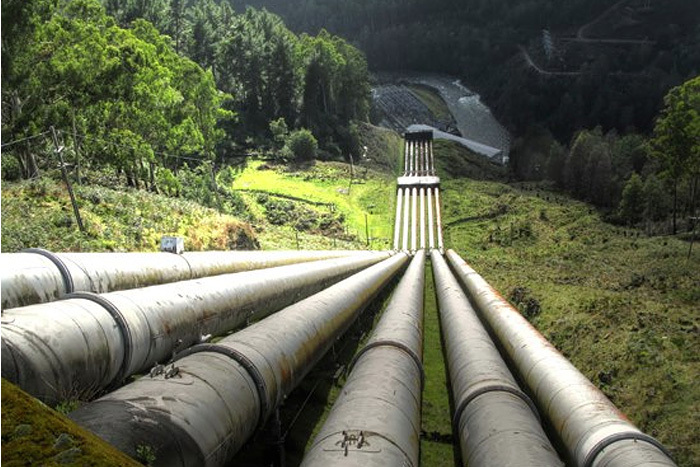 Kingston, NY: KingstonCitizens.org is pleased to present an educational discussion titled “Water and Waste Water Infrastructure 101” on Tuesday, March 24th, 2015 at the Kingston Public Library, 55 Franklin Street in Kingston, NY. from 6:00pm – 8:00pm. Moderated by KingstonCitizens.org’s Jennifer Schwartz Berky, the group will have the opportunity to speak with Water Resource Specialist CANDACE BALMER to explore water and wastewater infrastructure, how it is and can be funded, the importance of regular maintenance and the reality of periodic rate increases to keep this huge investment functioning. A question and answer period will also take place. This event is free to the public and will be filmed by Kingston News. Sponsored by KingstonCitizens.org with the support of the Woodstock Land Conservancy, Riverkeeper and Catskill Mountainkeeper. Ms. Balmer joined RCAP Solutions in March 1997 after previous experience as Associate Director, Pollution Abatement Technology Program at Westchester Community College and as Project Engineer with Environmental Resources Management, Inc. (ERM). Advisory Boards and Task Forces: NY Onsite Wastewater Training Network (OTN); Lower Esopus Watershed Partnership (LEWP); NYC DEP-coordinated Ashokan Reservoir Working Group (ARWG). Education: A.A.S. Water Quality Monitoring; B.A. Anthropology; M.S. Environmental Engineering. RCAP Solutions, Inc. is the Northeast regional partner of the Rural Community Assistance Partnership (RCAP). RCAP is federally funded to assist small rural communities with water and wastewater projects. The Woodstock Land Conservancy is a non-profit organization committed to the protection and preservation of the open lands, forests, wetlands, scenic areas and historic sites in Woodstock and the surrounding area. To be the strongest and most effective possible advocate for the Catskill region; working through a network of concerned citizens we promote sustainable growth and protect the natural resources essential to healthy communities.